Along with over 150 other Agencies and public bodies, for the past 12 months we’ve been transitioning our 5 main websites and many microsites to GOV.UK. We transitioned the majority of our websites back in February and we just have the Apprenticeships website left to do by December. It's now the home straight. It seems a life time ago now when we transitioned about 12 websites/microsites. We had our highs and lows, especially when faced with unforeseen delays and a fast approaching deadline. Yet the team pulled out all the stops and running at full sprint (pardon the pun) we successfully achieved our goal, a whole month before the GDS deadline. At the heart of the transition were our users, who had for years bounced around our websites looking for information and guidance. 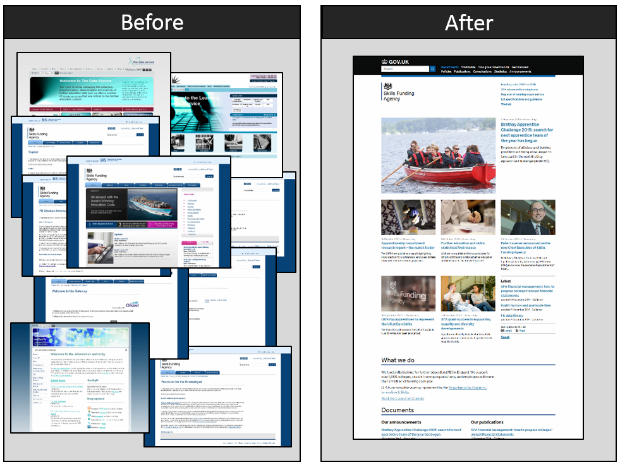 Since we have moved to GOV.UK we have been able to merge information and provide a much better user experience. Unlike our experience back then, the transition of the Apprenticeships website has opened up new challenges. We have had to overcome these to ensure we provide an improved experience for our wide range of users. Smooth user journey – The start of a user’s journey will be GOV.UK. Our content (split between mainstream and specialist) will form the start of a user’s journey on GOV.UK. Then through to our Find an Apprenticeship exemplar (launching in public beta in the next couple weeks), our off-platform online tools (see below), and our archived content on the National Archives. It’s critical that the user journeys between the on-platform and off-platform elements of the service are simple and clear. We are working with the GOV.UK and Exemplar content teams to ensure this happens. Timing – We’re conscious that when we do transition we will be directing all of our users to GOV.UK. The last thing we want to do is overload the public beta straight away, given that the team are aiming to bring users on board over time. It’s becoming a bit of a balancing act for timelines, but nothing we can’t handle. Non-GOV.UK content – The current website also hosts ‘non-GOV.UK’ content, including the National Apprenticeship Awards. This has proved to be particularly tricky as the Awards take place right in the middle of our transition sprints. So, we are working with GDS on how we can keep and update content during and after the Awards while we transition. All whist we make sure content is available on the National Archives. Our online tools – We will still host these on the current site, though in isolation, until we are able to redesign them in the coming months. It’s essential we ensure users have as smooth experience between GOV.UK and these ‘off-platform’ online tools. We’ll track usage and journeys to see where we can make improvements. Campaigns – We are having to look at new ways of providing this content to our user, potentially using campaign pages on GOV.UK and/or off-platform campaign sites. This is a challenge but also a great opportunity for us to be innovative and creative as we want to inspire our audiences into using our services. So, by mid-December our users will have a different user experience as they do now, but we are confident that their experience will be much better. Ultimately though the proof will be when we ‘switch over’ after the Exemplar public beta launches and we are able to conduct further user testing.